alaTest has collected and analyzed 552 reviews of Samsung 55Q7F (2017) Series. The average rating for this product is 4.7/5, compared to an average rating of 4.6/5 for other products in the same category for all reviews. Reviews about the durability and sound are on the whole positive. The design and usability also get good feedback. Many are critical about the glare and remote control. We analyzed user and expert ratings, product age and more factors. 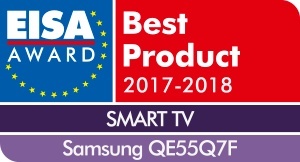 Compared to other products in the same category the Samsung 55Q7F (2017) Series is awarded an overall alaScore™ of 97/100 = Excellent quality. Samsung QE55Q7F review: QLED tech proves there's plenty of life in LCD yet. The war for HDR is far from over, and this is a formidable challenger to OLED. Welcome to Samsung's 2017 VIP table. Here you'll find the QLED series, which sits at the top end and replaces last year's SUHD range. QLED proves that the battle for HDR dominance is far from over. If you love colour and brightness, check it out. Avec ce téléviseur vendu 1790 euros, Samsung tente de contrer LG et ses modèles OLED avec un produit qui promet une belle qualité d'image et une multitude de service. Pari réussi ?